We all know that credit bureaus do make mistakes and that there might be errors in your credit report. You might have the same name as someone else. Or a collection might still be in there though the statute of limitations have been reached. Or the collection agency forgot to tell the bureaus that the debt has been paid up. We get it. Mistakes do happen. And we have been told that the fix is relatively easy. Just write to the the credit bureaus and if there is no proof of a negative or incorrect item within 30 days, they must remove it. But there is more to it than meets the eye. This video is a must watch. Many folks have been disappointed with the recent devaluation of the Hilton HHonors program. Much has been written about it. But in a nutshell, categories have been increased from 7 to 10 (which meant requiring more points for many but not all hotels). Points for exotic (or as the industry calls it – aspirational) hotels like the ones in the Maldives has seen point requirements almost double from 50,000 to 95,000. Many hotels in major cities have also see requirements increase, though many small European hotels have seen the opposite. When I checked the Q3 rotating categories for the Dividend Card from Citi (review here), I noticed that Hilton Hotels was in that 5% category. 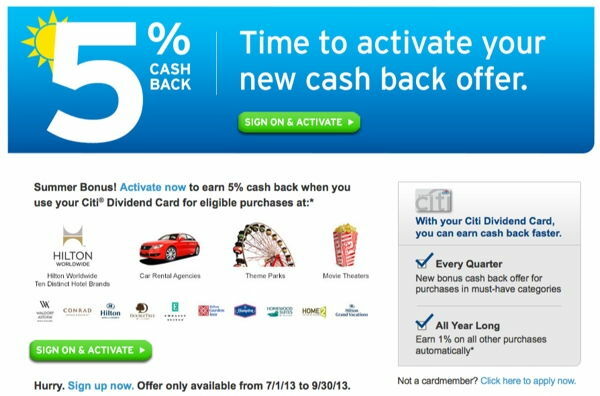 That means that when you book a Hilton Hotel, you could get 5% cash back (up to $1,500 in quarterly spending). This is the first time that I’ve ever seen a Hotel chain included in a 5% rotating category. Having said that, Citi does issue Hilton’s affinity cards so perhaps it was not a total shock. But this means that for the next 3 months, you have a way of getting what is effectively a 5% discount from Hilton’s chain of hotels for your summer vacation (if you have the Dividend Card). So if you have ditched the program or their cards, but still plan to stay there during the summer, do not forget to use the Citi Dividend Card (if you have one). Can I Leave Singapore With Credit Card Debt and What If I Want To Return? As mentioned in previous posts, one of the more frequent question we get asked is what happens to credit card debt when one leaves a country? Will they be able to return and get a job again. Most of these questions come from expats who work at very international cities. Today, we will try to address this issue with regards to Singapore. For the last few years, the Singapore economy has been booming, fueled by increased immigration, low tax rates and a very economic friendly environment. It has also come with problems like housing inflation and more recently, expats who rack up credit card debt, get laid off and cannot pay it off. Unlike many other countries, Singapore has more stringent laws with regards to debt and bankruptcy which complicates matter for those looking leave the country with debt. 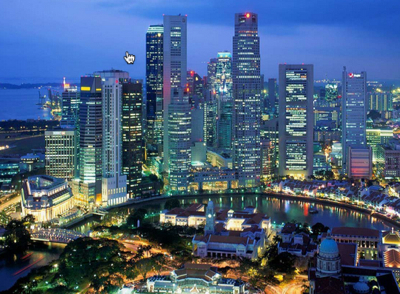 For expats of Singapore, it would seem unlikely to leave the country and never return again. But in the event you decide you’re going to leave your debt unpaid and never look back, you may find yourself in bankruptcy (in Singapore). Bankrupt in Singapore, is a bit different than bankrupt in the U.S. For instance, in Singapore, you can be “made” bankrupt by a creditor, while in the U.S., although it seems like you are being forced into bankruptcy, you still have to make the decision to file for bankruptcy. If the amount owed to all of your creditors (including credit cards and car loans) is at least $10,000, you can be made bankrupt in Singapore. The problem however isn’t just being declared bankrupt. The Official Assignee then seizes your belongings which in Singapore can include, property, tools of your trade, property held in trust for someone else, and even clothing and furniture. In fact, the any property can basically be seized including future property that the bankrupt person may come into possession in the future. In fact, if you even try to take vacation, you will need the OA’s permission or you can be fined up to $10,000 and/or jailed for up to 2 years. You may also lose your job and it will certainly make things difficult when trying to find a job. So, in this respect, if you leave Singapore without paying your debt and are declared bankrupt, plan on a rocky road if you ever try to live there again. It isn’t altogether clear what may actually happen to you upon entering and leaving the country if you have bad debt you have left behind either. Maybe you aren’t planning on ever returning to Singapore and you don’t care about being declared bankrupt. If you have family there who co-signed or are guarantors, they may be held responsible for your debt. If you are ever offered a job, you won’t be able to take it. Consider whether it’s likely that you will never, for the rest of your life, be in Singapore again. If you are moving from Singapore, it’s very likely that many of the debts you have are transferable. Most banks have relationships and branches in other countries and you will not only be allowed to transfer the debt, but also transfer your credit history. Of course, you still have the option to make payments on your debt after moving, even if the bank does not have a relationship with the country you are moving to. Your credit score in Singapore is not transferrable. Many credit card issuers, such as American Express, will issue you a U.S. American Express. It is much easier to establish credit history in the U.S. if you are able to transfer accounts or and payment histories or easily begin establishing a credit history if you have a card when you get here. However, whether you have a good or bad credit score in most countries, does not mean you will have the same good or bad credit score in the U.S. It is sometimes more difficult to obtain mortgages and other lines of credit if you do not have a credit score at all, and can be worse than having bad credit. If you consider both scenarios, it appears as though the best decision would be to transfer the credit card accounts and make an effort to continue to pay on the debt. This way, you may be able to establish a credit history in the new country with an already established history as well as be able to return to the original country without worry of jail or being made bankrupt. In most situations, the amount owed on the debt will not be worth skipping out on, no matter how convenient it may seem. One of the common emails and comments we get are from readers who find themselves wondering what will happen to debt if they move to another country. It isn’t always a plot to skirt responsibilities or rack up huge credit card balances with extravagant purchases and then flee the country. Sometimes there are legitimate reasons to leave debt behind and more commonly, the question is posed because consumers genuinely want to have their finances in order before they move, and when moving or changing countries, the United States is just a common destination. In this post, we will look at the situation in Canada. Credit reporting in Canada works a lot like it does in the United States with the same credit bureaus. In Canada, the main credit reporting agencies are Equifax Canada and TransUnion Canada, which hold all of the credit records from banks and finance companies in order to keep track of everyone’s credit worthiness. Credit scores by Equifax and TransUnion range from 300 to 900 and determine all of the regular things like whether a borrower is high or low risk and the interest rate. In Canada, lenders ratings on a scale from 1 to 9 may also be included. A “1” would mean you bills are paid within 30 days of the due date, while a “9” would mean you never pay your bills. There is also a lettering system with “I” meaning installment basis and “O” meaning open line of credit. So, on the credit report, you may see I2 or O9, for example. It’s safe to say if you don’t pay your bills in Canada, you’re going to suffer much as you would in the United States. Bad credit may result in credit and loan denials, high interest rates and potential lawsuits. According to ServiceAlberta.ca, if your debt is less than $25,000, the creditor may sue you in the Civil Division of Provincial Court which can lead to property being seized or wages being garnished. If you are unable to pay your bills and plan on moving from Canada, you may want to look into the statute of limitations for the province in which you live. For example, in Alberta, the Limitations Acts allows the time for suing on a debt to 2 years. If there has already been a judgment against the debtor, the time period is 10 years and can be renewed by the creditor. The BC Limitation Act in British Columbia is set at 6 years and in Newfoundland and Labrador, 2 years. According to Section 32 of the Crown Liability and Proceedings Act, things may be a little different when considering different debts such as student loans, child support, taxes and alimony. Additionally, the Statute of Limitations time period may be reset when you start making payments or acknowledge the debt in the form of payment or something written. This would mean that if you move from Canada and completely forget about your debt, don’t make any payments and don’t correspond with the creditor past the statute of limitations, the creditor will not be able to take any legal action against you for the debt. The debt will remain on the credit report until 7 years from the date of last activity. If you have any assets in Canada when you leave, the creditors may be able to seize those assets in Canada. This would include retirement accounts which can be used to pay off any debt you have left behind. Will My Bad Canadian Credit Follow Me? According to Experian, you cannot transfer your credit history from Canada to the United States. In order to establish credit in the U.S. , you would basically start over and obtain a credit account and build your credit with a positive repayment history or a secured account, much like you never had credit before. If you have an account with a multi-national lender, you may be able to transfer the account itself to the U.S. division to kickstart your credit history. American Express is one company that has been known to do this and sometimes banks can transfer payment histories on accounts. Depending on your situation, this can be either good or a pain in the neck as far as credit is concerned. Angie Mohr, Canadian Chartered Accountant and author of a number of personal finance books, has personal experience with having to start over building credit in the United States. “The Canadian credit score doesn’t follow people to the U.S.- which is a huge issue for those who have stellar credit in Canada but get dinged in the U.S. because all of their U.S. credit is so new.” However, when you return to Canada, your credit score in the United States may be incorporated with your Canadian score. Unlike leaving credit card debt in a country like Singapore and returning, you won’t be declared “bankrupt” by your creditors. If you return to Singapore after having been declared bankrupt in the courts, you could have a difficult time finding a job and any of your belongings may be seized. In Canada however, returning could be less eventful with just a bad credit rating waiting for you. It is always best to tie up any loose ends and see which accounts can be transferred before you move to another country. After all, you never know when you may want to return and it’s always easier if you left under good terms. It is also far less of a hassle to deal with your creditors than attempt to avoid them. 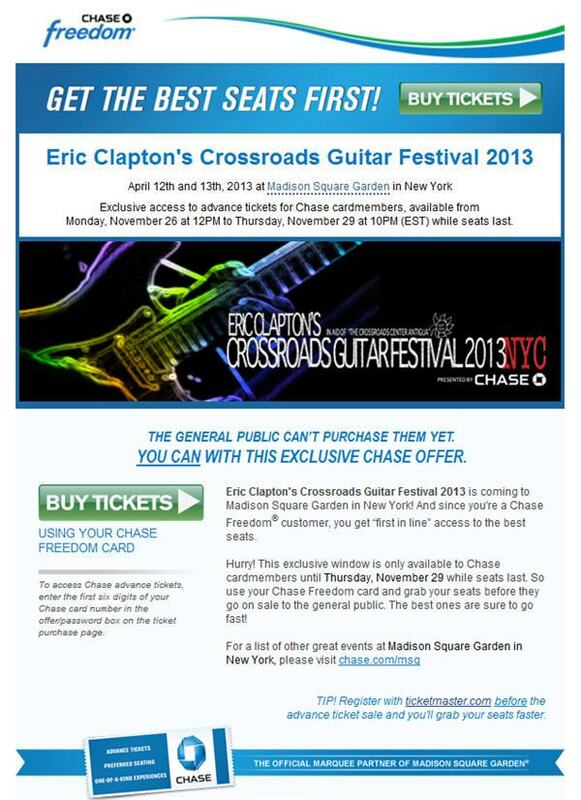 I just got an email from Chase (since I have the Chase Freedom Visa&#174) and was informed that Chase cardholders will be able to book advanced tickets to the Eric Clapton CrossRoads Guitar Festival in 2013 from 12pm 26th November 2012 until 10pm 29th November 2012 (Thursday). The 2013 event will be held on 12th and 13th April at the Madison Square Gardens in New York City. (Note: Mrs Credit Card has the Chase Sapphire Preferred(SM) Card and she also received a similar email). Below are the screen shots of the email and the websites. To book the ticket online through the site below, you would need to enter the first six digits of your credit card number under the promo code area. This will be a great concert and you should hurry if you want to get great seats. This event was first organized in 2004 event at the Cotton Bowl in Dallas (by Eric Clapton himself). It was also organized in 2007 and 2010 just outside Chicago at Toyota Park in Bridgeview, Ill. The proceeds from the concert will benefit the Crossroads Centre, which is a drug treatment center located on the island of Antigua in the Caribbean country of Antigua and Barbuda. This facility was actually founded by Eric Clapton after he suffered from substance abuse issues. 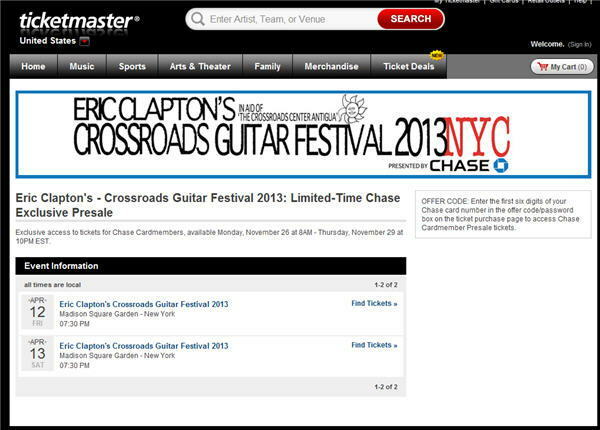 There will be more than 25 of the world’s greatest guitarists performing and the line up includes Robert Randolph, Jimmy Vaughan, Jeff Beck, Doyle Bramhall II, Gary Clark Jr., Eric Clapton, Robert Cray, Andy Fairweather-Low, John Mayer, Blake Mills, Keb Mo, Allman Brothers Band, Booker T, Sonny Landreth, Brad Paisley, Kurt Rosenwinkel, Vince Gill, John Scofield, Keith Urban, Dave Biller, Buddy Gay, Allan Holdsworth, BB King, Earl Klugh, Jonny Lang, Citizen Cope, Albert Lee, Robbie Robertson, Los Lobos and Taj Mahal. Here are some interesting recaps in the land of credit cards and loyalty programs. I am a cardholder of a couple of Chase credit cards, as well as other issuers like Amex. 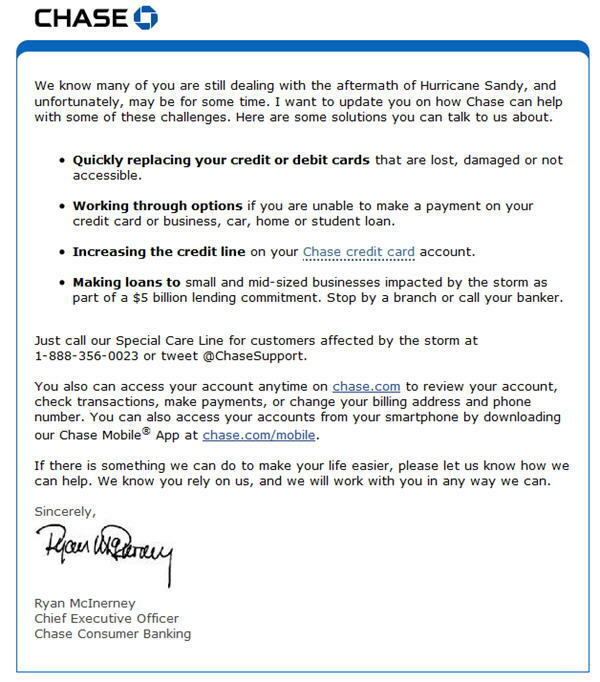 And Chase was the only one who sent me emails on how they would be helping their customers in the North East who faced the wrath of Hurricane Sandy. Thumbs Up to them for being a good corporate Citizen. We have just updated our review of the US Airways MasterCard from Barclays. Right now, the sign up bonus is 40,000 miles (though you do need to transfer a balance to achieve the full amount). Citi has just introduced a feature called Price Rewind for their consumer card members (business cards do not have this feature). If you make a purchase on their card and you find that the product is being sold cheaper for $25 or more within 30 days of your purchase, you could get a refund from Citi. They are some exclusions and fine prints, but this looks like another attractive feature added to their cards. The difference between this and other price protection features is that Citi will actually track the prices online for you. SouthWest and Airtran’s nationwide sales is ending tomorrow. If you are planning trips in the not so distant future, and both airlines fly from your airport, then you should head over to their sites and check out some fares. If you purchase an annual US Airways Club Lounge membership by 18th November 2012, it will be slightly cheaper ($400) and you also have the chance of earn 5,000 Preferred Dividend Miles. This is equivalent to earning slightly more than 12 points per dollar spent. So for those of you who intend to make their purchase anyway, better do it soon. As a refresher, you get access to US Airways Club Lounge, United Club and Star Alliance Lounges. The promo code is 5KPQM. From now until the end of the year, you can earn bonus BA Avios miles when spending with their partners. For example, you can earn up to 2,500 miles per stay at < a href="http://www.frhi.com/promotions/British-Airways-Partnership-Launch/" target="new">Fairmont, Raffles and Swissôtel Hotels and Resorts. These are the other hotels that will earn you bonus Avios Miles – AccorHotels, Langham, PHG, Marriott, Shangri-La, Carlson, Starwood and Taj. Those of you who have been following us for a while know that I live in Philadelphia. And our family went through Hurricane Sandy. In our area, we were relatively OK. But many folks in New Jersey took the brunt of the storm in terms of damages etc. Throughout this period, I have received various emails from Chase (as we are Freedom and Sapphire Preferred card members) telling us how they are responding to their customer in the NorthEast region. And I must say that I am really impressed. We have quite a few credit cards and we have only really heard from Chase. 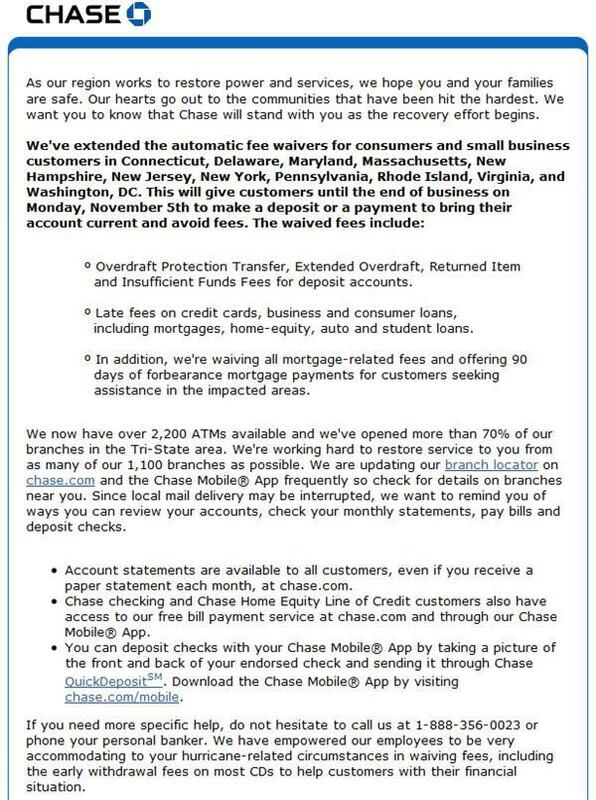 Here is a recap of the emails we received and what Chase said they would do to help their customers. On 2nd November 2012, they sent out an email saying that they will be waiving fees for consumers and small business customers in Connecticut, Delaware, Maryland, Massachusetts, New Hampshire, New Jersey, New York, Pennsylvania, Rhode Island, Virginia, and Washington, DC. This will give customers until the end of business on Monday, November 5th to make a deposit or a payment to bring their account current and avoid fees. Fees that they are waiving include overdraft protection transfer fees and credit card late payment fees. 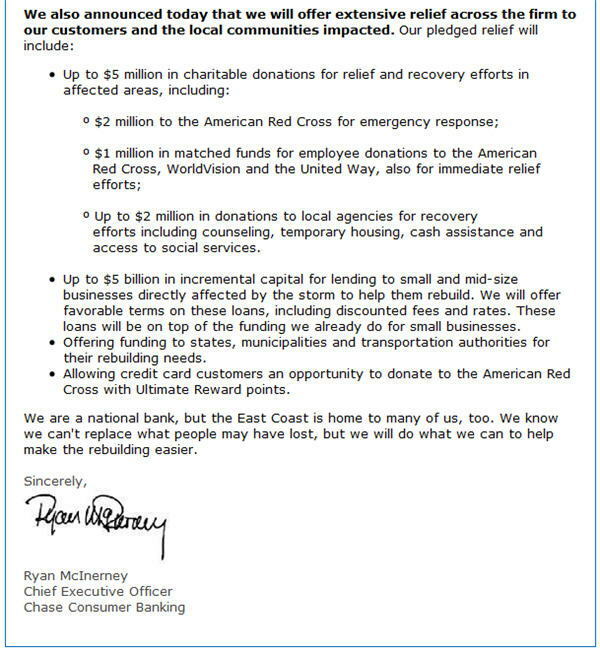 Chase also mentioned their donation efforts to various organizations involved in Hurricane Sandy. For example, they are donating $5 million to various organizations including the Red Cross and United Way. On November 8th 2012, Chase sent out another email. This time they mentioned additional measures that they were taking to help their customers. They include working with their customers if they cannot make payments on time and even increasing credit lines. Chase has even said in the email that they have committed $5 billion in making loans to small businesses impacted by the storm. To be honest, I am really impressed with this. I have several American Express cards and have not gotten a single email with regards to Hurricane Sandy. This is really good PR for Chase if nothing else. But as millions of people lost their power and many folks are still not allowed into their homes in New Jersey, these measures taken by Chase will help folks to some degree. I personally have the Chase Freedom&#174 Visa and Mrs Credit Card has the Chase Sapphire(SM) Preferred Card and we have absolutely no hesitation to recommending these cards and any Chase card given the improvements they have made on their reward program over the last 2 years. And with them being what I would consider responsible corporate citizens in the wake of the Sandy devastation in the North East, Chase has gotten a double thumbs up from me. Presale tickets for the George Straits: Cowboy Rides Away at the Power Balance Pavillion in Sacremento in California New Orleans Arena (also in CA) are now available to American Express Gold, Platinum and Centurion members. Card members of the Delta Platinum and Reserve Cards can also book these presale tickets. Fans of George Strait would know that he announced his first 20 dates of the Farewell Tour for 2013 and 2014. The tickets for his concert in Oklahoma City sold out within a few hours! Since his debut in 1981 where his single “Unwound” became a top ten hit, George has gone on to record 59 number one singles and winning awards after awards (last count was 60). Below are the presale ticket details. There are several ticket options for Amex card members. 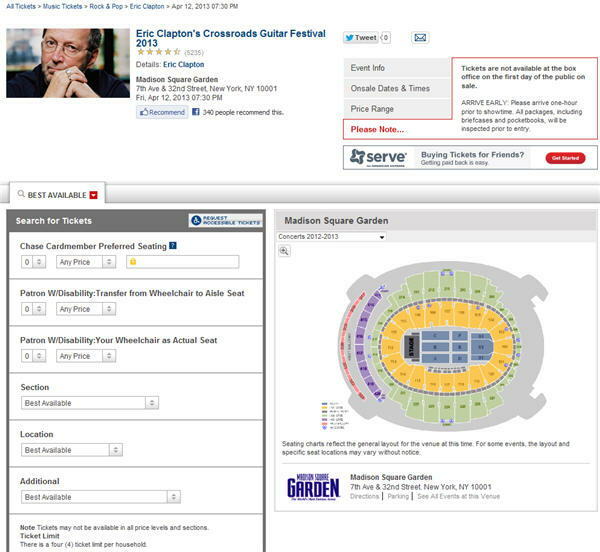 You can simply get presale tickets, or go look for preferred seating tickets if you want to get better seats. There are also a couple of interesting packages available if you want to get a better experience. 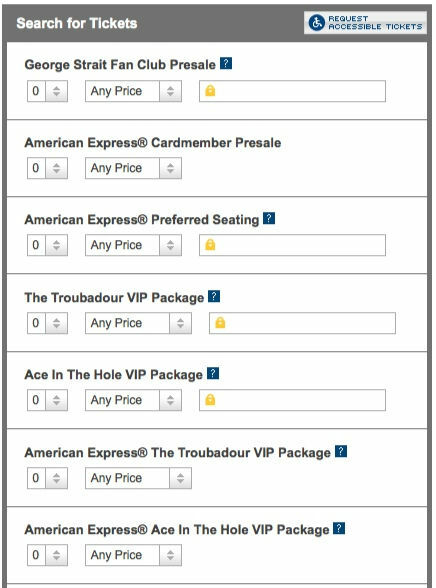 The Troubadour VIP Package – This package includes one front row ticket (awesome! ), one George Strait signed guitar (mega awesome! ), VIP parking pass, one VIP laminate, invitation to pre-show party in “The King’s Tavern Lounge” w/ complimentary food and cash bar. You can also see “The Kings Exhibit”, which is a private exhibit of George Strait memorabilia that travels with the tour. This is only available to VIP guests and guests of George Strait. 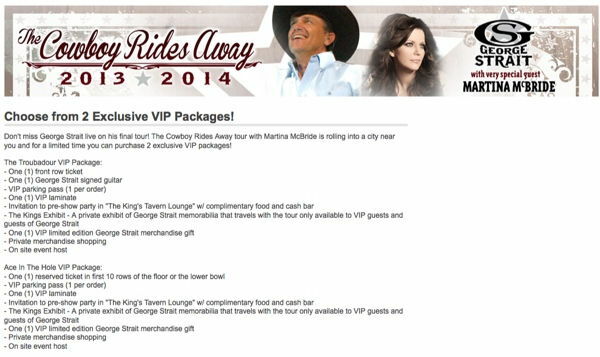 The package also includes one VIP limited George Strait merchandise gift, private merchandise shopping and on site event host. Ace In the Hole VIP Package – This package has all the features of the above one except that rather than being guaranteed a front row seat, you will get a seat anywhere from row 1 to 10. For Amex card holders, you have to enter the customer service number that is printed at the back of your credit card to “unlock” the seats available for you to book. Like we have mentioned before, these tickets will sell out quickly. Having an eligible Amex card will help you get better seats. So check your calendar and book them now if you are a fan of George Straits. Just checked my email a while ago and found the following message from my Chase Freedom&#174 Visa card. 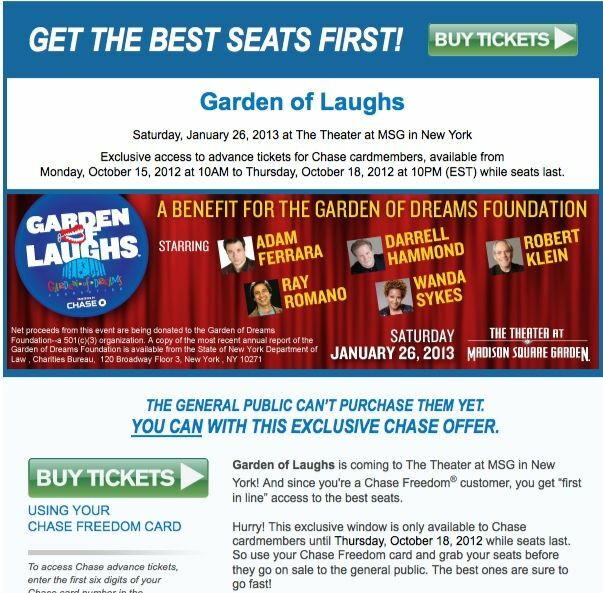 From today until Thursday 18th October 2012), Chase card members have exclusive access to pre-sale tickets for the Musical Garden of Laughs at the Madison Square Gardens 26th January 2013 8:00pm. The show is produced by Emmy Award-winner, Rory Rosegarten. This event will be a one-night only event featuring the best known names in stand up comedy. They include Adam Ferrara, Darrell Hammond, Robert Klein, Ray Romano and Wanda Sykes, with more comedians to be announced. This event is being put together to benefit the Garden of Dreams Foundation, which is a non-profit charity that works with all areas of The Madison Square Garden Company, including MSG Entertainment, Rangers, Knicks, Liberty, MSG Networks and Fuse. This presale is available to all Chase card members (not just the Freedom card). You have to use the first six digits of your card number to gain access to the available seats. For those of you who are fan of any of these comedians and who live in the North East Area, you might just want to get some good seats within these couple of days. 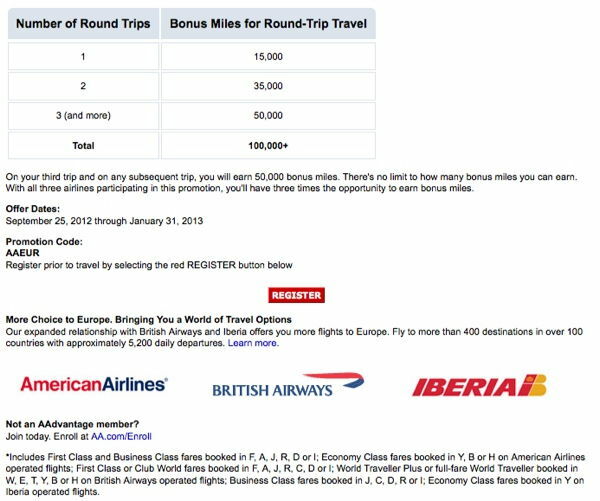 A week or so ago, I mentioned the British Airways 100,000 Avios miles deals and also the US Airways 250,000 Bonus Miles deals. But I overlooked the fact that American Airlines was running similar deals as well. So here a recap of the present promotions they are having to encourage you to fly with them, or use their partners and earn some extra AA miles. Firstly, AA has a very similar deal to BA for flights to Canada and Europe. For the first round trip that you make in First Class, Business Class or Select Economy Class Tickets, you will get 15,000 bonus AA miles. For the second trip, you will get 35,000 bonus miles. 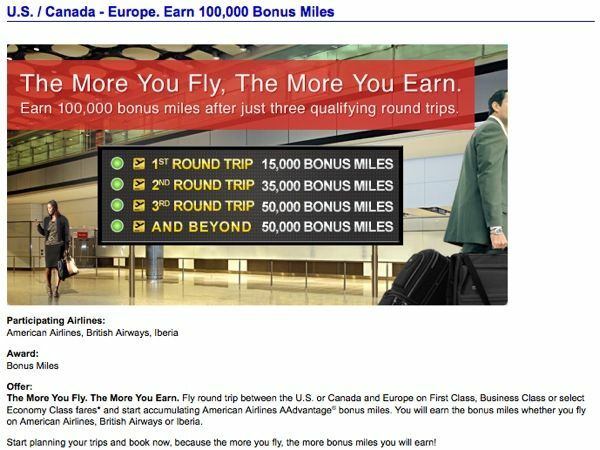 From the third trip onwards, you get 50,000 bonus miles each time you fly. You can earn unlimited bonus miles with this promotion. This means that if you are a few transatlantic flight planned or flights to Canada, you are in for a bumper bonus. The participating airlines include American, BA and Iberia. This promotion is good for flights from 25th September 2012 until 31st January 2013. Triple Miles At Radisson Hotels – AA members can also earn triple miles until 20th December 2012 when they stay at Radisson Hotels. 4X Points with Hertz Booking – AA members can earn 4X miles per dollar when they book a Hertz car rental and get up to a 35% discount as well. This deal is good until 30th November 2012. You simply need to rent for a day or more and renting at the following countries qualify: U.S., Puerto Rico, Mexico, Canada, Belgium, the Czech Republic, France, Germany, Italy, Luxembourg, the Netherlands, Slovakia, Spain, Switzerland and the United Kingdom. The discount code is CDP# 217692, PC# 169676. And you obviously need to have your AA number when you book it. Up to 10,000 Bonus Miles For Buying AA Miles – AA has a bonus promotion going on now until the end of October for those buying miles. For simply buying miles, you will get a 25% bonus. The minimum miles you must buy is 6,000 and the maximum is 40,000. Within this range, you will earn anywhere from 1,500 to 10,000 miles. You can also earn bonus miles when you need to top up your account for an award ticket. Once again, minimum purchase required to earn bonus miles starts at 6,000.